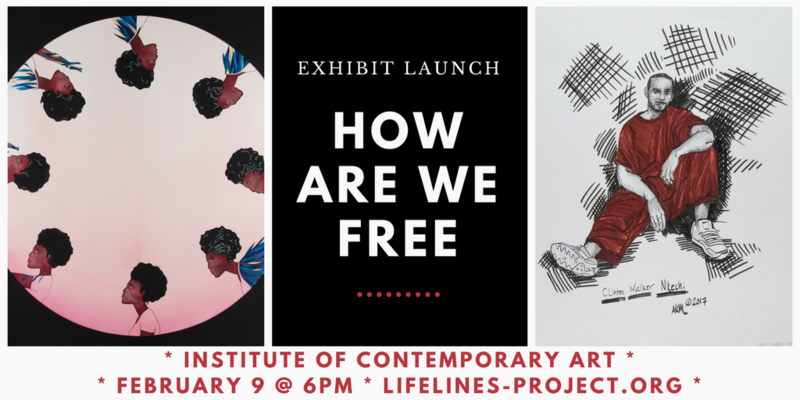 How Are We Free is a visual art exhibit that explores the nature of freedom and confinement through creative collaboration between people who have been sentenced to die in prison and visual artists outside the prison walls. Visual economies and regimes of power have been massively employed by the state and the media in order to criminalize people. This exhibit interrupts those regimes and instead invites viewers to investigate what actually creates conditions for safety, healing, justice, transformation, and liberation. The participating artists are: Makeba Rainey (Philadelphia), Noelle Lorraine Williams (New Jersey), Matice Moore (Baltimore), Alma Sheppard-Matsuo (Philadelphia), Gb Kim (Brooklyn), Robin Markle (Philadelphia), and Kate DeCiccio (Washington DC). Their collaborators on the inside are Clinton “Nkechi” Walker, Terri Harper, Felix “Phill” Rosado, Avis Lee, David “Dawud” Lee, Marie “Mechie” Scott, and Charles Boyd. The exhibit was currated by Layne Mullett and Emily Abendroth. Selections from the exhibit will appear as part of the Art As Resistance Gallery at Beyond the Walls: Reentry Summit and Prison Healthcare event on Friday October 5th from 8am to 5pm at the Pennsylvania Convention Center. Learn more and register for the conference here. Selections of the How Are We Free exhibit traveled to Pittsburgh to be part of the Letters & Liberation exhibit. Letters & Liberation were up at the BOOM Concepts Gallery at 5139 Penn Ave in Pittsburgh from July 6th through July 29th. Emily Abendroth spoke about the How Are We Free exhibit on a panel discussion Rendered: Art, Wrongful Imprisonment, and Guantánamo, featuring artist Debi Cornwall. The event took place on June 28th at 6pm at the Philadelphia Photo Arts Center, 1400 North American Street #103 in Philadelphia. Selections from the exhibit appeared as part of Women in Reentry Day Art Exhibit, which took place on May 9th at Broad Street Ministry. Learn more and see the whole program for Women in Reentry Day here. How Are We Free was on display at the Scott Memorial Library at Thomas Jefferson University in Philadelphia for the month of April. A portion of the exhibit appeared at the Our (Digital) Humanity: Storytelling, Media Organizing and Social Justice Community Conference at Lehigh University on April 21st. The exhibit opened at a one night event at the Institute of Contemporary Art in Philadelphia on February 9th, 2018. Bring How Are We Free to your town! We will be traveling with the exhibit across the state of Pennsylvania — to community spaces, churches, art galleries, universities, and more. We want this conversation and the effort to end Death By Incarceration to continue to expand, and we’re looking for places where the show can be up for a month and can include some educational events/programming alongside. Have an idea for where we should go? Let us know at lifelinesphilly@gmail.com. Looking for other ways to support the project? Donations are gratefully accepted here. You can check out the accompanying publication for the exhibit below. Emily Abendroth is a poet, teacher and anti-prison activist. Much of her creative work investigates state regimes of force and power, as well as individual and collective resistance strategies. Her books include ]Exclosures[ from Ahsahta Press and The Instead, a collaboration with fiction writer Miranda Mellis, from Carville Annex. She is a founding member of the Coalition to Abolish Death By Incarceration (a grassroots campaign working to end life without parole sentencing in Pennsylvania); Address This! (an education and empowerment project that provides innovative, social justice correspondence courses to individuals incarcerated in Pennsylvania); and the media project LifeLines: Voices Against the Other Death Penalty. Charles Boyd has been fighting a Death By Incarceration (DBI) sentence for the past thirty-five years. He is co-founder of the Let’s Circle Up (LCU) Restorative Justice project and the internal coordinator for the Alternatives to Violence Project (AVP), which focuses on community building and conflict resolution. He has been a member of the Graterford Inside­-Out Think Tank for fifteen years. He volunteers as a Hospice Caretaker and works in the Alcohol and Other Drugs department as a Certified Peer Supporter. Charles has a BA in Interdisciplinary Studies from Villanova University. He is an environmentalist who loves music, art, and creating safe spaces where people can discover their personal and collective sense of agency. He is committed to ending the inhumane practices of DBI sentences and mass incarceration in general. Terri Harper is a writer, a member of the LifeLines project, the Coalition to Abolish Death By Incarceration, and the PA prison society, and is the current president of the Muncy Inmates Organization. She loves to cook, write, read, and laugh. As the seasons continue to change in her life and the lives around her, she is actively doing all she can to change her actions and their outcomes, so the world around her and at large can be better in some way. Originally from Philadelphia, she’s been serving a Death By Incarceration sentence for the last 27 years. 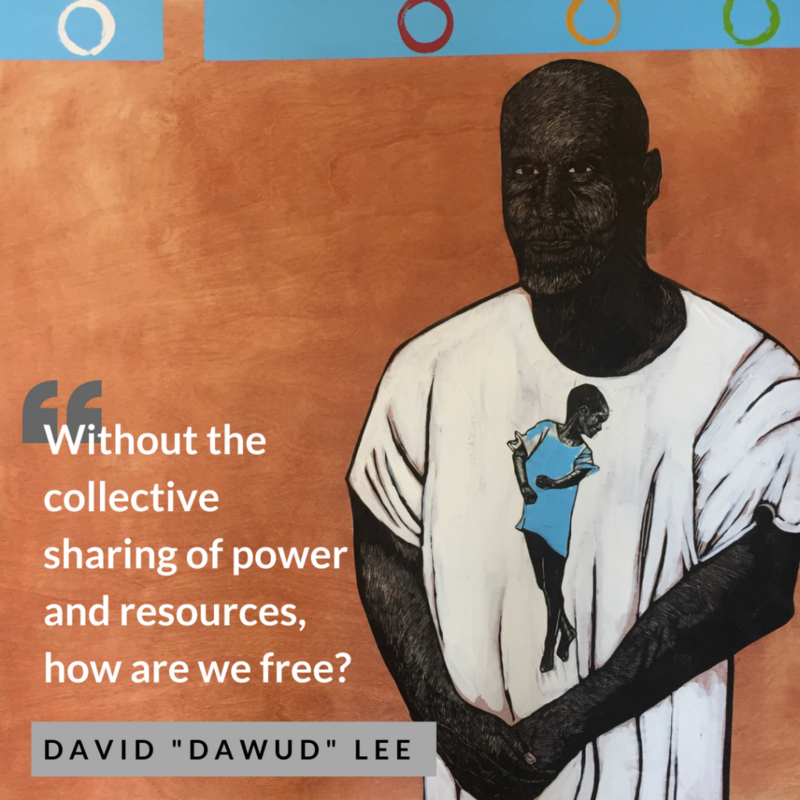 David “Dawud” Lee is a cofounder of One Hood United (a platform for uniting community activists with conscious prisoners) and a founding member of the Coalition to Abolish Death By Incarceration. He is also part of the LifeLines Project, and serves on Decarcerate PA’s Inside Advisory Board. Originally from Philadelphia, he has been serving a Death By Incarceration sentence for the last 30 years for a crime he did not commit. Over 25 of those years have been dedicated to educating himself and others, to utilizing his education in an effort to fight for his release from captivity, and to creating a truly liberated social arrangement here in the United States. He is a prolific writer, mentor, and friend to many on both sides of the prison walls. Avis Lee is a certified Braille translator, currently working as a Peer Assistant in the Therapeutic Community program. She is a member of Let’s Get Free: Women and Trans Prisoner Defense Committee, and the coauthor of the play Chin to the Sky. She also serves on Decarcerate PA’s Advisory Board. Avis was born in Altoona, PA, grew up in Pittsburgh, and has been serving a Death By Incarceration sentence for the last 38 years. She enjoys genealogy, knitting, crocheting, and gardening. Layne Mullett is founding member of Decarcerate PA and the Coalition to Abolish Death By Incarceration, and a co-creator of LifeLines: Voices Against the Other Death Penalty. She has been active in social justice movements for over a decade, organizing against gentrification, austerity, and the prison industrial complex, and working for the freedom of political prisoners. Her writing has been published in the journal Perspectives on Anarchist Theory, in the anthology Life During Wartime: Resisting Counterinsurgency, and in the forthcoming book The Long Term. Layne currently serves on the Community Advisory Board for Critical Resistance. She lives in Philadelphia. Felix Rosado is cofounder and co-coordinator of Let’s Circle Up, a restorative justice project based at Graterford State Prison. Originally from Reading, PA, he has been fighting a death by­ incarceration sentence since 1995. He also co-coordinates the Alternatives to Violence Project and is a member of the Inside-Out Graterford Think Tank. In 2016, he earned his Bachelor of Interdisciplinary Studies degree from Villanova University. He is an advisor to Decarcerate PA, as well as to Eastern State Penitentiary’s Prisons Today Exhibit and Returning Citizens Tour Guide Program. As a member of Right 2 Redemption (a founding organization of the Coalition to Abolish Death by Incarceration) and Lifelines, he seeks to end the practice of caging humans until death. Marie “Mechie” Scott is an organizer, writer, and lifelong advocate for children of incarcerated parents. While she’s been incarcerated, she has written legislation, started support groups, and participated in numerous projects and organizations. She was born in Harlem, New York on the fourth of July and is the mother of two children. She is a writer and editor, as well as an aspiring pianist. She is featured in Howard Zehr’s book Doing Life: Reflections of Men and Women Serving Life Sentences. She has been serving a death by incarceration sentence for the last 45 years. Clinton “Nkechi” Walker is a an avid reader, a writer, and a poet. His poetry has been published in Apiary Magazine. He’s also a self-proclaimed singer, though many who have heard his vocals would strongly disagree. Though he’s had few opportunities for academic achievement, he takes pride in the fact that he’s been able to develop a strong mental strength and character despite the horrors, hardships, and assaults of the prison system. Originally from Philadelphia, he’s been serving a Juvenile Life Without Parole sentence for the last 18 years. This project is a labor of love, and there are so many people without whom this exhibit never would have happened. First, huge thanks to the artists and LifeLines members whose collaborations are featured on these pages. We are so inspired to see this work come into the world, and so appreciate your time and labor in making this happen. Huge thanks also to Dave Onion for graphic design support (including this publication! ), Karen Kirchhoff for photography, Chenda Cope for managing the creation of the display, the Institute of Contemporary Art for hosting our launch event, the Sparkplug Foundation for providing the initial funding, and to the many other people who have volunteered their time, energy, and expertise to make this project a reality.